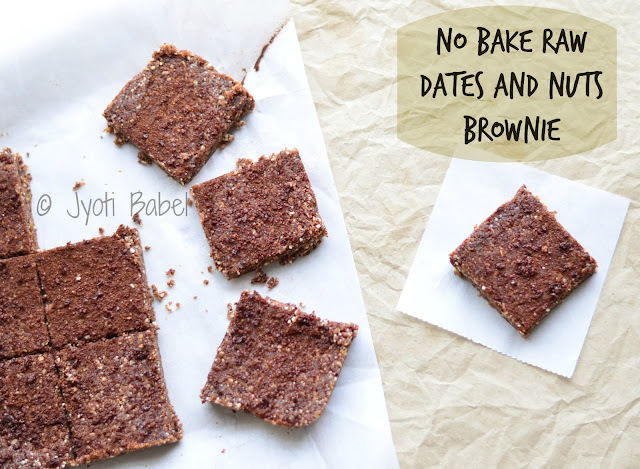 No Bake Dates and Nuts Brownies is the answer if you are looking for a healthy and quick snack to munch on. I had long wanted to try a no-bake brownie. But, being an ardent chocolate lover I had my doubts if such a brownie will be worth the try. Well, we will never know about it unless we try. So for the 3rd day of the blogging marathon under the 'brownie theme,' I decided to try yet another version of our beloved brownies - No Bake & Raw Dates and Nuts Brownies. I used this recipe as an inspiration to come up with my version. I didn't use chocolate ganache as I wanted to make it as healthy as possible. No Bake Dates and Nuts Brownies. 1. Line a 6 inch tin with parchment paper and set aside. 2. In a blender jar, add the pitted dates and blend it till it looks like a fudgy mess. Take it out into a large bowl. 3. Now finely powder the almonds in the same jar, followed by walnuts. I then added them together again in the blender jar together for a quick mix. 4. Add it to the bowl again, add cocoa powder and bournvita powder (if using). Using a spatula mix it and then tip it into the parchment-lined cake tin. 5. Spread it evenly and press it to get an even surface. Dust some cocoa powder or bournvita powder over the set brownies. 6. Let it sit for 10 minutes and then slice it. They are ready to devour. 1. For those looking for really healthy brownies, it is a good choice. You can alter the quantities of nuts to suit your taste. Walnuts might give a slightly bitter taste in the end. So, you can use just 2 tbsp of it or skip altogether. 2. I think they tasted best after a day. The first day they tasted like dates and nut bar. But, on the second day, the flavour of cocoa was more pronounced giving it a good chocolatey taste. 3. If you want to make it more decadent, go ahead and cover the brownies with a layer of chocolate ganache. Or you might add some ganache into the dates and nuts mix. In that case, you might have to let the set brownies rest for a while before you slice to get neat slices. Want to try some other brownies? I have got you covered. Check these recipes. These are so much in trend now due to least time required and health factor as well... looks so good! A super tempting brownie. Loved all the three brownies that you have posted this week. Lovely looking no bake brownies. Love the addition of bournvita. 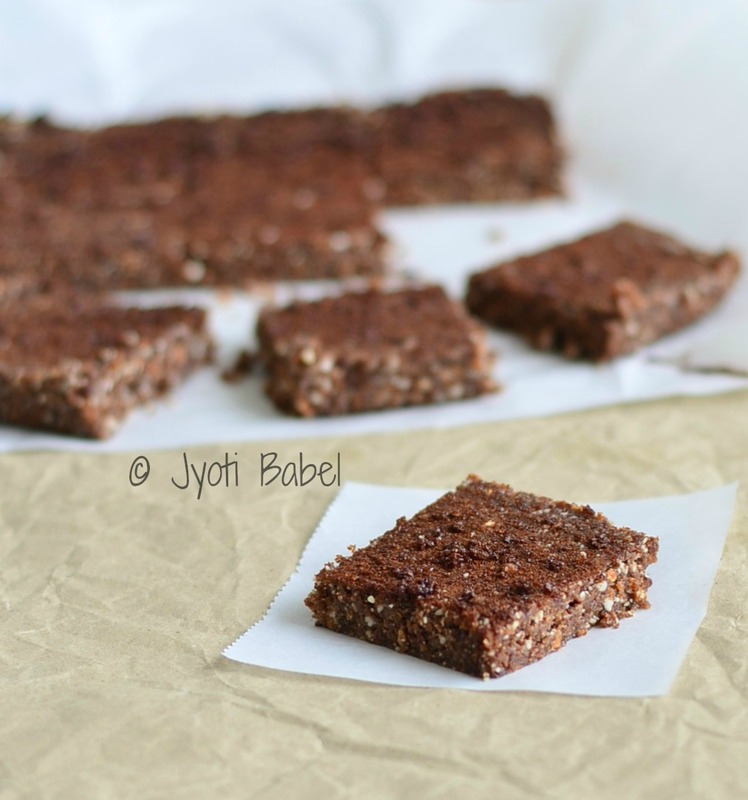 Wow jyothi, all your brownies are bookmarked, i have seen this version in many blogs, this is seriously tempting, love the crisp pictures!